A carbon tax or cap and trade system is a tax on emissions that contribute to global warming, particularly CO2. It is likely to be the most effective way to lower CO2 emissions by forcing those producing this product pay their fair share for the damage it is doing to the environment. This tax would in theory encourage lower carbon usage and the proceeds would go to encouraging low carbon technologies and minimizing the tax's impact on low income users. This is not a new idea, making those responsible for pollution pay for its impacts. When a company spills a harmful chemical, they are responsible for cleaning it up. In the United States, if you emit a substance that has been shown to create acid rain, you must pay for permits for it. It only makes sense that pollutants that are contributing to arguably the largest environmental crisis of the century cost something. There are two current systems being proposed to put a price on carbon dioxide emissions. The first system is a carbon tax, that is a flat rate that must be paid for each unit of carbon dioxide emitted. This is similar to a gasoline tax. 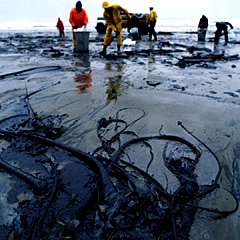 The second system is a cap and trade system, where the government auctions permits to pollute up to a certain amount. These permits can then be traded between those who have made cuts in emissions and those who have not. There are advantages and disadvantages to each of these systems, which you can learn more about in the How We Get There section. Regardless of how we do it, the ultimate message is that we need to do something to take into account the damage CO2 is doing to our planet and to make it more costly to produce.